The concept of “white privilege” is an issue currently in vogue. It forwards the theory that most whites have an advantage over most blacks and other people of color, simply because of the color of their skin. It’s a big deal on college campuses with courses being given in it. Life is not fair: some people are tall (an advantage), some people are fat (a disadvantage). some ugly (a disadvantage), some good-looking (an advantage), etc., etc. Since skin color cannot be easily changed, minorities need to overcome this inherent disadvantage and everyone needs to be aware of any bias they might have against others. I know from personal experience that my physical handicaps kept me from achieving my potential and that my great parents and Ivy League education helped prepare me to somewhat overcome my half-paralyzed face, closed left eye and very poor equilibrium that my first brain tumor left me with. In addition, I learned that I had to try exceptionally hard in order to overcome the stereotype that my particular physical handicaps portrayed of me. On the other hand, though much less common, black priviledge is sometimes an advantage. Huh? President Obama was elected President after serving only two years as a U.S. senator. This was previously unheard of! Why? White guilt! In addition, Affirmative Action helps anyone of color, even members of wealthy African-American families. Is that fair to the very poor of any race or nationality? 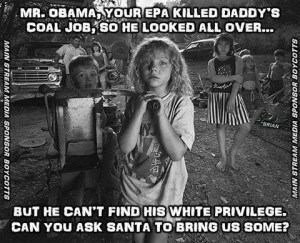 Therefore, shouldn’t Affirmative Action help the poor of any race? I believe that government can only do so much to correct the unfairness of life and that in attempting to do so, it often makes things worse for the people it is trying to help, through unintended consequences. Good intentions count for nothing. Only results matter! Just one example will prove my point: prior to the passage of the Americans with Disabilities Act (ADA), about 53% of the disabled were employed. Last I checked, about 31% were employed. Why? Due to the ADA, it’s nearly impossible to fire someone who is disabled, so employers try not to hire them to avoid not being able to fire them if they don’t work out. The solace to the unfairness of white privilege, as well as other unfair things that life throws in our paths, is that success is that much sweeter when we overcome and prevail.